You should buy this yogurt starter if you are looking for a no-fuss yogurt starter which is easy to use and makes thick, creamy and absolutely delicious yogurt. Our starter contains lactic acid bacteria isolated from natural sources in ecologically preserved areas in Bulgaria. It produces yogurt of exceptional quality with smell and taste like nothing you can find in the store or make with any other yogurt starter. The Bacillus Bulgaricus starter is extremely durable and does not need to be refrigerated during transportation. The freeze-drying process we use guarantees that the live active bacteria is actually live at the time you start making yogurt. The yogurt starter comes with easy to follow instructions that guarantee success every time. With and without using an yogurt maker. Remember – it is easy to make yogurt! The Bacillus Bulgaricus yogurt starter is completely natural. It does not contain sucrose, gmo, gluten, additives. Actually it doesn’t contain anything else but two bacteria strains. And it contains a lot of those, more precisely billions and billions of the right kind of bacteria, compared to the store-brand yogurts and most of the other yogurt starters which only contain bacteria in the millions. This is also the reason why it always works — your yogurt will never be runny when you make it with Bacillus Bulgaricus. In fact, we are so confident that you will love the yogurt which this yogurt starter makes, that we are offering 100% no questions asked, money-back guarantee. If the yogurt doesn’t set after you follow the instructions or even if you don’t like the taste of the yogurt, simply let us know. We will refund your money. No other product’s guarantee comes close to this. And if you need more reasons – just keep reading. 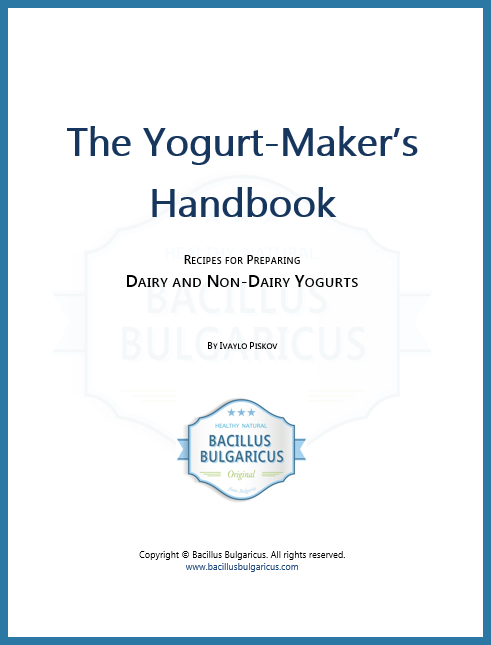 If you are looking for a no-fuss yogurt starter which is easy to use and makes thick, creamy and absolutely delicious yogurt then you should buy the Bacillus Bulgaricus starter. In my 20 or so years of yogurt making I’ve never had more consistent and tasty results than what I’m getting when using this yogurt starter. Yogurt is absolutely easy to make, the whole process is basically 6 steps with minimal effort (i.e. mix, stir, cover) and the result is super delicious. I can also easily control the thickness of the yogurt by using milk with different (higher) fat content or by adding half-and-half to my milk, however the results I’m getting in terms of thickness when using 1.5% milk are more than enough for me. The yogurt sets quickly, is thick, creamy, and not runny. Never, not once. How about you? Have you ever got this consistent results with an yogurt starter? Maybe you had but chances are that you haven’t. How about paying once for yogurt starter and then having yogurt for the rest of your life? Or longer than that? I am not kidding. The bacteria in the yogurt can outlive you. The live active bacteria in our yogurt starter continues to live in your yogurt and all you have to do is store a little bit of yogurt from the one you made and use it for making your next batch. And again. And again. When stored properly you can repeat that process to infinity. I do recommend that every now and then you use some fresh starter — just to mix it up a bit but it is entirely up to you if you want to do that. And if the largest size on this website (Yogurt Starter Infinity) is not enough for you, let me know and I’ll send you a custom made size. Let me ask you to read the previous paragraph one more time and just think for a moment how much money you can save on yogurt if you reuse yogurt from your previous batch. One packet of yogurt culture can be used to make unlimited amounts of homemade yogurt. There is no need to continually buy new yogurt starter. You can go on making homemade yogurt indefinitely. It probably is already obvious but I will go ahead and tell you that making yogurt at home is an economical option that saves more than 50% compared to buying yogurt at the grocery store. Money you can then spend on buying the things you love to put in your yogurt – honey, berries, granola, anything you like your yogurt with. This yogurt starter contains lactic acid bacteria isolated from natural sources in ecologically preserved areas in Bulgaria. It produces yogurt of exceptional quality with smell and taste like nothing you can find in the store or make with any other yogurt starter. The yogurt starter is fully natural. It does not contain sucrose. Actually it doesn’t contain anything else but two bacteria strains. And it contains a lot of it, more precisely billions and billions of the right kind of bacteria, compared to the store-brand yogurts and most of the other yogurt starters which only contain bacteria in the millions. This yogurt starter does not contain bifidus bacteria. I’ve yet to find any commercial yogurt that doesn’t contain bifidus. I’m actually fine with it but if you are on a SCD diet the Bifidobacterium (frequently shortened to Bifidus) is considered anathema to the people on the SCD diet. This starter is the SCD diet recommended yogurt starter culture because it contains two, and only two strains: l. bulgaricus and s. themophilus. Nothing else. No “other”, “unknown” or “miscellaneous additional” bacteria which are frequently listed under “Ingredients:” on commercial yogurt containers. This product comes with a 100% no-questions asked money-back guarantee. Try the starter and if you don’t like it for any reason or decide that it is not for you, I will refund your money — no questions asked. No other products’ warranty comes close to this. If the yogurt doesn’t set after you have followed the instructions or even if you simply don’t like the taste of the yogurt that it makes, simply let me know. I will refund your money. I will even take on the credit card fees. Our starter is extremely durable and does not need to be refrigerated during transportation. The freeze-drying process we use guarantees that the active bacteria is LIVE at the time you start making yogurt. It doesn’t matter if you live in Arizona or the Sahara Desert and if it is scorching outside. I have actually tested the durability of the culture by leaving it on top of the radiator for 2 weeks and then used it to make yogurt – boom, nailed it like every other time. So if you worry about ordering online because this thing can get spoiled or dead on its way to you, don’t. There is nothing to worry about. We ship to any part of the world from one of our 6 hubs (that sounds big but they are actually pretty small distribution facilities) and it usually takes between 1 and 8 days for the yogurt starter to reach you, which is much shorter than the two weeks I left the yogurt starter on top of the radiator to see what happens. The yogurt starter also comes with easy to follow instructions that guarantee success every time. With and without using an yogurt maker. Remember – it is easy to make yogurt! You don’t have to take my word for it — take it from all the satisfied customers who have tried the starter, many of them over and over again. See some 5000+ testimonials here. Or you can try it for yourself and see if you like it. It’s easy to buy it online. We live in incredible times – thanks to the Internet, you can now source a product from anywhere in the world. This was not possible a few years ago. Even if you don’t try the yogurt starter, let me know where do you usually go to get your yogurt starter from? How do you use it? Does it always set for you? What makes you like it (or maybe hate it)? Send me an email telling me what excites you about yogurt and making yogurt. Be honest! I read every single email (yes, really). Or if you don’t want to send me your story, join my mailing list and I will share with you the stories of other people who tell us about their yogurt making practice. There’s always something to be learned from other people’s experience and I would love to share that with you. Buy some online now and make your very own Bulgarian yogurt at home! This entry was posted in Lactobacillus Bulgaricus and tagged Bacillus Bulgaricus, best yogurt starter, Bulgarian yogurt, Lactobacillus Bulgaricus.